I've had an iPad for over a month now. And even played movies downloaded from iTunes video podcasts. But, up until my friend Dev Benegal asked me, I didn't bother finding out how to create a movie for iPad playback. On the actual page this is one long paragraph. I've spaced it out and simplified it. So this is a good starting point. Looks like the iPad's processor can play back H.264, mp4, and M-jpeg. 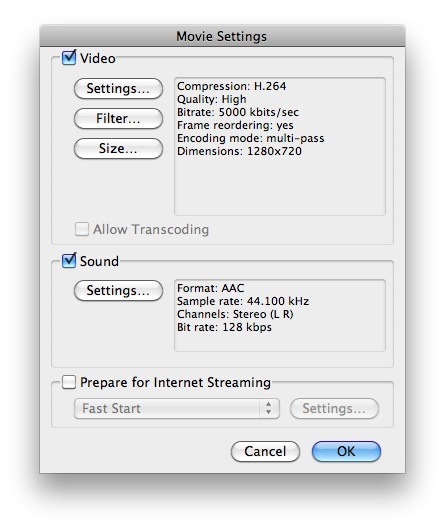 Data rates for H.264 aren't given, but it can play mp4 at 2.5 Mbps and M-jpeg at 35 Mbps. "Note: While QuickTime does not provide an iPad specific export component, the iPad is capable of playing media exported using the Apple TV export component." So, if one has Apple Compressor installed one can create a preset, input these values and go for it. 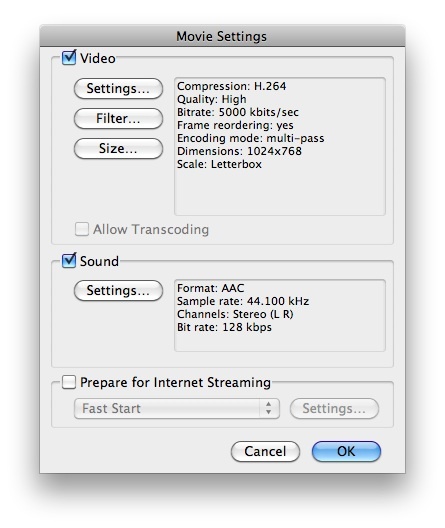 If you don't have Apple Compressor, then you need at least Quicktime Pro. I made a small tweak to the size and set it to 1024x768 with a letterbox added in case the original was not in the 1024x768 proportion. If you need the movie to be generic and playable on a MacBook/Pro as well AppleTV, then you can omit the 1024x768 resize and stay with 1280x720. Resizing to 1024x768 will make the frame size about 20% smaller at the same data rate so it might be of a better quality visually. Going from H.264 at 1920x1080 at 80 Mbps to H.264 1024x768 at 5 Mbps. Depending on the format of your original, your mileage may vary. A tip to make this go faster is to change the encoding settings from multi-pass to single pass in the Video settings window. With that set, the same 1 min movie took under 3 mins. Either way the quality was great. To get the movie into iPad you need to take it into iTunes and select it for syncing when you connect the iPad to your Mac. This might work for movies ripped from DVDs as well, though Apple hasn't designed it that way. They expect you to buy the movies from the iTunes store. At IBC last year, Arri announced a new camera. A successor to the D21 - a digital camera to shoot movies with. That was Sept. 2009. Last week at NAB (a large international post-production exhibition and conference at Las Vegas) Arri showed the camera. Its now called Alexa. Arri had a working prototype at their booth. Something you could touch and feel and shoot with and watch the output of, on a HD monitor. The most important thing Arri have done with the Alexa is to sort out the production and post-production workflow in a manner that's simple - probably simpler than the Red. Whether this helps them sell well and better then Red, only time will tell. The pricing is not a bit higher than the Red, though. In it's base configuration the Alexa shoots at a resolution of 3 k with a frame size of 3072x1728. This is downsized to HD at 1920x1080 and recorded to SxS memory cards as Apple ProRes422HQ or Apple ProRes4444. ProRes422HQ has a data rate of 145 Mbps while ProRes4444 has a data rate of 330 Mbps. 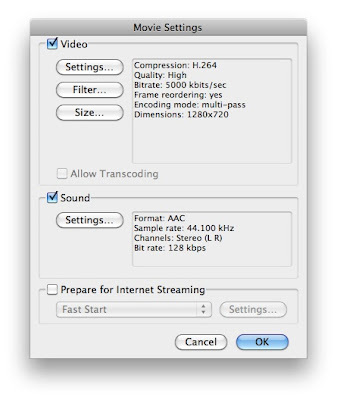 To put this into perspective, Panasonic D-5 tape stores video at 220 Mbps and Sony HDCamSR does 440 Mbps. 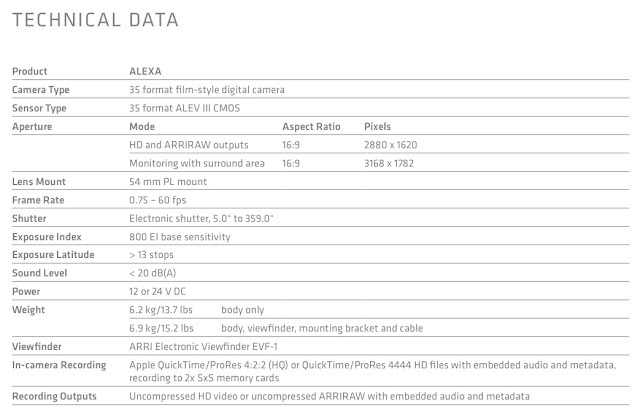 So, in terms of data rate, and hence arguably, quality, the Alexa at ProRes4444 is somewhere between D-5 and HDCamSR. This HD output is also available as a HD video signal which can be recorded to HD video tape like HDCam or HDCamSR. In fact, this is a safe way or working. ProRes4444 on SxS cards and the same HD video to HDCamSR tape. The tape becomes a backup. For even higher quality and latitude, the Alexa also can record Arri RAW to a certified Arri T-link recorder. Like the Codex, S.two, or KG models of recorders. These recorders cost as much or more than the camera. The camera itself (pro set with DTE option) costs about Euros 52,500 (about Rs 40 lakhs incl. Customs Duty). 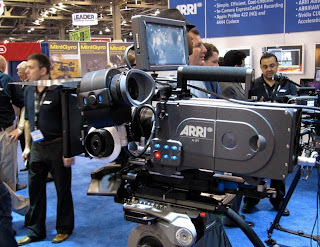 And the recorder that can record Arri Raw costs another US$ 60,000 (about Rs 36 lakhs incl. Customs Duty). 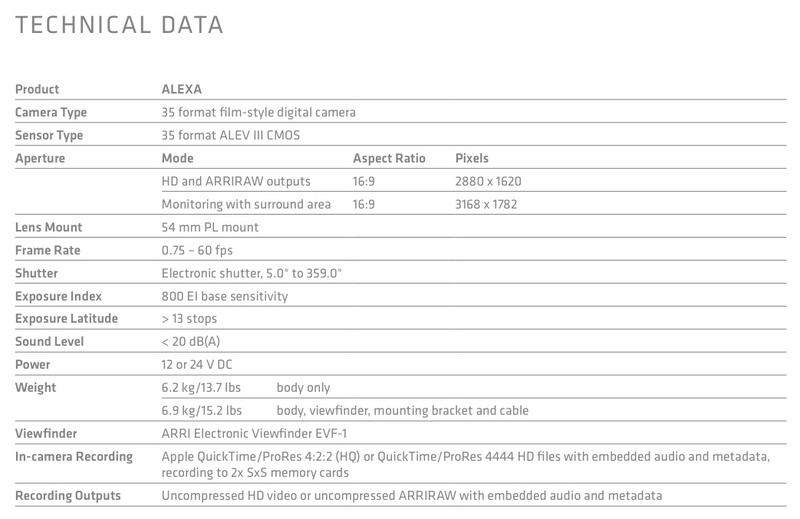 The Arri Raw recorder records to hard disk about 15 Gb per min. So, if you are shooting a feature film of 120 mins at a shooting ratio of about 5:1, you need about 9000 Gb or 9 Tb space to store 10 hrs of Arri Raw rushes. At a shooting ratio of 10:1 which is what people do, when they shoot digital, you're looking at 18 Tb. To be safe you need to back this up in two sources - disk and LTO. Now, going by what non-film cameras like the Red rent out for in India, my guess is that the Alexa will also rent at a premium. 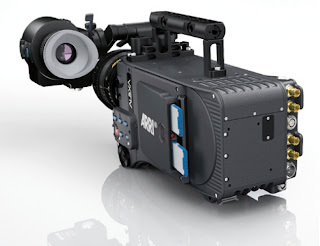 Meaning you will need to shell out two times or more per day for an Alexa what you would, for an Arri 435 film camera. This differential alone will make potential film-makers think twice about shooting digital. Add to that the FUD (fear, uncertainty, doubt) factor around digital, it will take a while for someone to have the guts to do an entire mainstream film on a digital camera like the Alexa. As if that isn't enough, the sheer cost of providing safe secure storage for digital Arri Raw data, will make most producers balk at the idea. At a conservative estimate, 8 Tb of safe secure RAID storage will cost at least Rs 1,20,000 for an 8 Tb RAID. That will add up to Rs. 2,40,000 for 16 Tb. This cost will need to be borne by the producer as well. Of course after the film is done, one can delete the unused rushes and then reuse the storage for forthcoming films. But the initial acquisition of a high quality disk storage will have to be made. Many film-makers may settle for Apple ProRes4444 which takes up just 130 Gb per hour, or 1.3 Tb for 10 hours going up to 2.6 Tb for 20 hrs. And, for many purposes, ProRes4444 provides nearly all the bandwidth and sheer picture quality that Arri Raw would have given you, but at a fraction of the disk space and bother of file conversion. At NAB, I was told, about 300 Alexa cameras were sold worldwide. In all probability, one or more people from india have bought one, or are considering one. So, come June, when the Alexa ships, one will see an Alexa somewhere in India, most likely in Mumbai. For someone looking at an alternative to film, and who doesn't want to mess with the workflow of Red because his editor or cinematographer has heard bad things about it. And needs a camera that responds just like a film camera - the Arri Alexa is a good choice. If you have the budget and inclination for shooting Raw, and a recorder is available, then go with shooting Raw. There's, of course, more to the Alexa than just post-production convenience. Its latitude, dynamic range, 35mm sized sensor and compatibility with existing 35mm film lenses. Features that might appeal to the cinematographer and make the camera closer to a film camera. There isn't (yet) an optical viewfinder, but they may add one later in the year. But for ease of use and simplicity, stick with shooting ProRes4444. The files will open and can be edited directly in FCP. And even in Avid Media Composer ver. 5. After editing, these files will open directly in Smoke on a Mac for any effects work. Even windows apps like 3DStudio Max can use these files for any CGI work. For grading, the yet-to-be-released Resolve on Mac will be able to grade ProRes4444 files. So there you have a clean and simple workflow. For shooting digitally for features and shorts. Even ad films and music videos.